Exploring is part of this creative world, but not all of our readers are experts or have been following us for a long time so today I’ll welcome you back to the basics. A few months ago, I told you that if I had to choose one ink pad (in a hypothetical world), I would choose the VersaMark Ink. Today I am sharing with you one of the multiple reasons why I consider it my must-have product. We have inks in almost all colors but with the VersaMark Ink you create a watermark effect that enhances the color of the paper. I love this effect and love the subtle appearance it creates. In my project, I am using Sahara Sand cardstock and if you notice on the above photo the ink is the same as the paper, just a little darker to create more emphasis over the stamped image. Select your color of cardstock and ink your stamp with VersaMark. Stamp your image once, twice or as many times that you need it to obtain all the details and a darker color. In my sample, I stamped twice. Let the ink dry for a few minutes. And this multiple stamping is easier with a stamping tool such as the Misti Stamping Tool. Repeat the process to stamp the “Thanks” sentiment. But this time you can create a totally different effect using the VersaMark with Embossing Powder. You only need to ink your stamp with the VersaMark and then cover the stamped image with Silver Embossing Powder in my case or with any other color of embossing powder and melt it with the heat tool. VersaMark is an excellent embossing ink. To make my card more special, I cut the stamped sentiment with the corresponding die cut and stamped the complement sentiment making the same process. If you want to obtain a major texture you can repeat the stamping process all the time that you wanted…just don’t burn your paper! I wanted to create leather texture effect which can be used on gift tags. 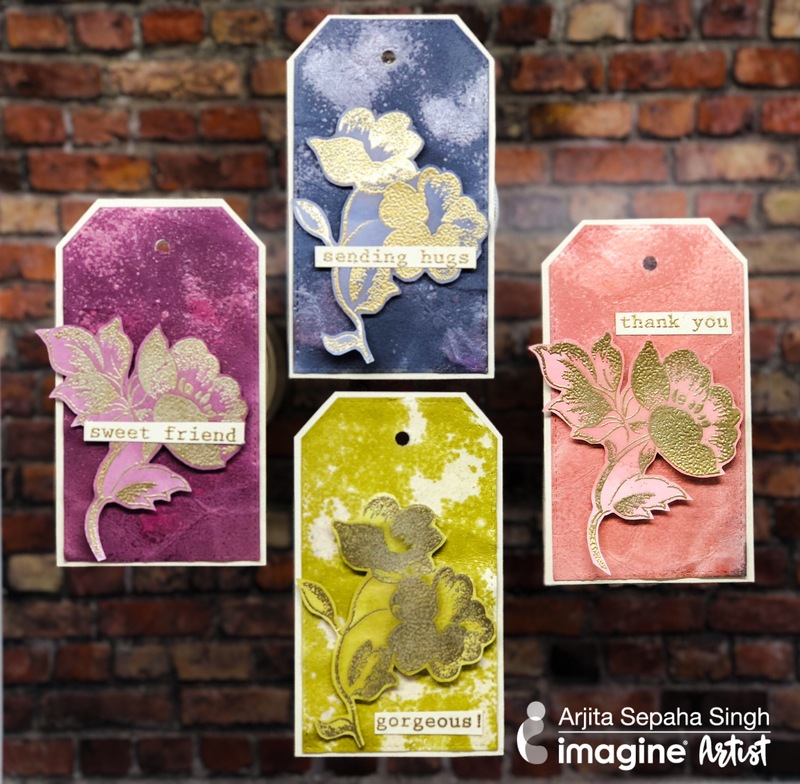 I sprayed Imagine’s Walnut inks on paper tags and allowed them to dry completely. Next, I added Goosebumps Texture Spray to create the randomness and variety in texture and color. Then I added more intense color sprays and crumbled the tags. This gave a cool leather-like texture and I finished the tags by adding a gold heat embossed flower and sentiment. Getting a beautiful water coloring effect without actually watercoloring is super easy with Memento markers and selective coloring. I used a smooth paper, which allows the Memento inks to create a blended single layer with ease. Once I stamped the flowers and leaves the only place I used a water brush was to spread some color on the leaves for quite a lovely effect. Watch the video for full details and share with us if you try the technique yourself!